How to View WiFi Password, Twitter, Reddit and other Passwords from iOS Devices (No Jailbreak) | F.C.E. 365 - Your Best Jailbreak and iDevice-Related News! In today's video review, I will show you how to recover the WiFi password and other website and e-mail passwords stored on your iOS device (iPhone, iPad or iPod Touch) using 4uKey – Password Manager by Tenorshare. This program is pretty simple to use, but don't be fooled by its simple user interface. It packs a very powerful mechanism which allows you to find saved Wi-Fi password on your iPhone/iPad or iPod Touch from your PC or Mac, recover stored websites & app login passwords from your iOS device if you forgot them, scan and view your mail accounts saved on the iOS device, and much more. This is very useful if you happen to have forgotten your password for various services but you are still logged in on your iOS device. It's also useful if you cannot remember your WiFi password but it's still connected on the device. What is even better? It lets you export the passwords to your favorite Password Managers like LastPass, Dashlane, 1Password and even to Google Chrome directly so that you don't lose it again. It also allows you to save them in plain CSV, though I do not recommend leaving such files in plain sight on your computer. This program is pretty useful if you have multiple devices and you'd like to pull your passwords and add them in a single place. During my tests, the program ran smoothly, did not add any abnormal burden to the CPU, RAM or the Hard Drive, and it did not exhibit any serious network activity. The program is therefore quite lightweight and I believe it would work even on low memory Mac computers. The lowest I could test was on a MacBook Pro 2009 with 8 GB of RAM running macOS El Capitan. The program ran fine with no glitches, so it is safe to assume that if you are 2-3 versions behind on your macOS it may still work fine, though that may change in the future as the libraries used in macOS age and have to be updated, so keep an eye on that. As mentioned at the beginning of this post, the user interface is rather simple with only a few buttons and some graphics to guide you. This is actually a good thing, since this way anybody can use it regardless of whether they are tech savvy or not. The activation of the program was swift, the key takes only a few seconds to arrive if you purchase their full version and the activation is mostly instant assuming a good internet connection. (Yes, you will need an internet connection to activate the software).
! NOTE: This program cannot recover your passcode or your lock screen password and neither can it recover your iCloud credentials. It's not built for that purpose. 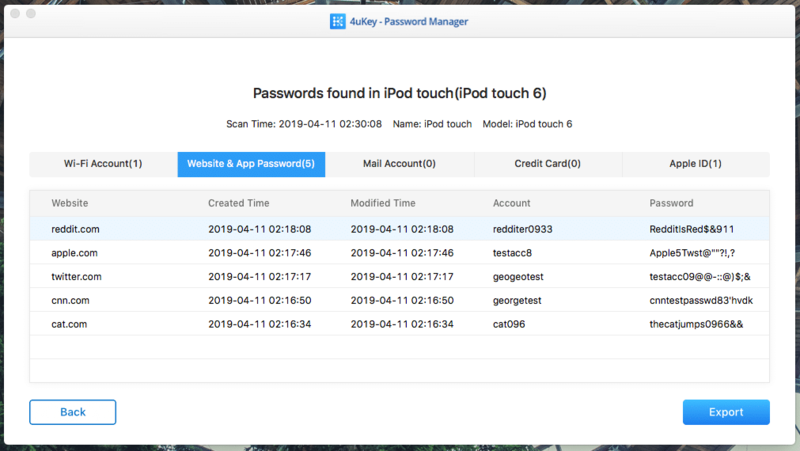 Overall, I think 4uKey – Password Manager is quite ingenious given the limitations iOS has which normally don't allow easy access to such data. This tool doesn't need you to be jailbroken so you don't have to compromise your device's security to recover your forgotten credentials which is great. Full disclosure: This post was sponsored by Tenorshare, but the review is objective. ← NEW iOS 12.1.2 / 12 Tw3lve JAILBREAK RELEASED | IS IT BETTER THAN Unc0ver?